It was during the First World War that the advantage of fielding highly trained snipers became apparent. The German Army were first to realize the usefulness of snipers and recruited “Jaeger” (hunters) who were practiced at navigating natural environments without being seen, good at stalking in close, and expert marksmen with a rifle. In the trench warfare German snipers would set up protective steel shields with a shooting slot in them so they could freely practice their craft until the British decided that an elephant rifle would knock over their steel shield so British counter snipers would use sporting elephant rifles against their foe. By the time the Second World War began governments and senior military commanders may perhaps be excused if they had assumed that modern weaponry such as aircraft, tanks and artillery, had rendered the role of the sniper obsolete. It turned out that the role of the sniper was very much required as the Battle of Stalingrad was to demonstrate. 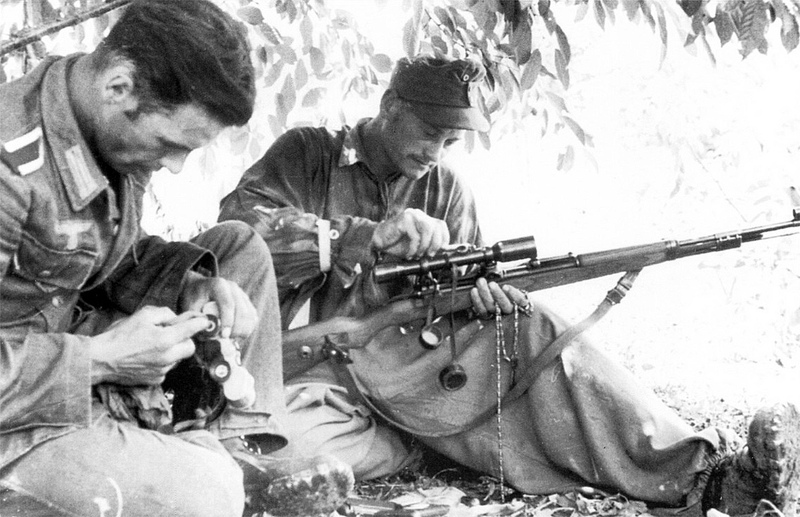 German sniper team during World War II. The German snipers certainly had some of the best equipment during the Second World War. German optics were and still are second to none in the world and the Austrian optical maker Kahles were the first in the world to create a rifle-scope back in 1898, the same year as Paul Mauser introduced his rifle of 1898. An example of a Gustloff Werke Mauser 98 sniper rifle fitted with an Austrian Kahles rifle-scope in the “Long Rail” mounts. Note: the elevation turret is marked 1-8, this is for the “bullet drop compensator” and is graduated for distances from 100m-800m with standard issue ammunition. (Picture courtesy hermann-historica-archiv.de). Amongst the most sought after of the German Mauser 98 sniper rifles are those made by Gustloff Werke of Suhl with the “Long Rail” mounts. During the war the German military created a letter coding system to identify where war matériel was made so their enemy would have difficulty in identifying industrial targets. For example, in the picture below the rifle-scope is marked “bmj” to denote its manufacturer which in this case means Hensoldt Wetzlar. In typical German/Austrian style the Gustloff Werke Mauser 98 sniper rifles featured a quick detachable rifle-scope so the scope could be removed when needed. This is only partly so that a failed rifle-scope could be easily removed. A sniper does not necessarily find himself/herself in a situation where they’re able to take a deliberate shot from a concealed position. Sometimes there is a need to get the rifle-scope off and stashed away for situations where the action is up close and unfriendly and field of view becomes paramount. Gustloff Werke “bcd/4” Mauser 98 sniper rifle with “Long Rail” mounts and “bmj” code Dialytan 4x rifle-scope for sale by Rock Island Auction. The rifle comes complete as pictured with rifle-scope case. (Picture courtesy Rock Island Auction). In the upcoming Rock Island Auction on-line sale scheduled for February 16th-19th, 2017 is the Gustloff Werke “bcd/4” Mauser 98 sniper rifle with a “bmj” code Dialytan 4x rifle-scope in “Long Rail” mounts. The 4x Dialytan rifle-scope looks like it has the standard “bullet drop compensator” on the elevation turret marked from 100m-800m. The rifle also has the safety catch extension commonly found on these Gustloff Werke sniper rifles. Rock Island Auction’s condition rating for this item is NE – Good: in working condition, finish 40% – 79%; PRF – Professionally Refinished or Restored. Left side view of the Gustloff Werke Mauser 98 “Long Rail” sniper rifle coming up for sale by Rock Island Auction. (Picture courtesy Rock Island Auction). The Gustloff Werke rifle with the Dialytan rifle-scope in the “Long Rail” mounts is expected to sell for around USD$2,000-$4,500. For those interested in the sniper variations of the Mauser 98, Richard D. Law’s book “Backbone of the Wehrmacht, Vol. II: Sniper Variations of the German K98k Rifle” is a recommended resource. You can find it on Amazon if you click here. Richard D. Law’s first book “Backbone of the Wehrmacht, German Kar98K Rifle, 1934-45” is worth having if your interest is in all versions of the Kar98K. You’ll find it if you click here.